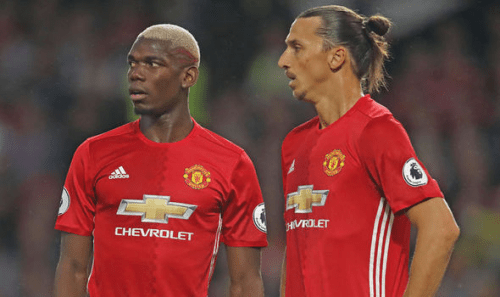 MANCHESTER: Manchester United supporters could be treated to the long-awaited returns of Zlatan Ibrahimovic and Paul Pogba when their team resume their Premier League campaign against Newcastle United on Saturday. The pair, so instrumental in United’s success last season, are back in full training and may be named on the bench as manager Jose Mourinho attempts to integrate them back into his first-team plans. Ibrahimovic, 35, has made an impressive recovery from the career-threatening knee ligament injury he suffered in April. Pogba’s injury was less serious, but the 24-year-old France midfielders has nevertheless been sidelined since mid-September with a torn hamstring. In his absence, United’s play has stuttered compared with their impressive early-season form and, of the two, his return could be the more pivotal. Ibrahimovic said in an interview in his native Sweden that he will return from his injury stronger for the experience. “I’m determined to return better and stronger than before,” said Ibrahimovic, whose side trail league leaders Manchester City by eight points. “That is my goal and it will happen. There are no other options. “When I’ve decided to do something, nothing is going to change my mind. I said I would take over Sweden. At breakfast I had already taken over Sweden. The veteran forward also said he is relishing the prospect of partnering Romelu Lukaku in the United attack, having handed the Belgium striker his number nine squad shirt when Lukaku signed from Everton. “I was asked who I thought was good in the league and I mentioned Lukaku,” said Ibrahimovic. Defender Marcos Rojo is making good progress from his own knee ligament injury and played for United’s under-23 team in mid-week, although he may not be in contention for the Newcastle visit. Mourinho, who has been plagued by injury problems in recent weeks, is finally seeing some light at the end of the tunnel, with midfielders Marouane Fellaini and Michael Carrick both available for the game. Phil Jones has also recovered from the thigh injury he suffered while on international duty, offering Mourinho options in defence, with Eric Bailly likely to partner the England man at centre-back. Newcastle are set to be without injured trio Jamaal Lascelles, Mikel Merino and Christian Atsu as they go in search of what would be only a second victory in 23 league visits to Old Trafford. Manager Rafael Benitez, whose side sit in 11th place with one win from their last six games, will assess Ciaran Clark after the defender’s return from duty with the Republic of Ireland. Dwight Gayle hopes to keep his place in the starting line-up after being recalled for the 1-0 defeat at home to Bournemouth before the international break. The former Crystal Palace striker grew up as a Manchester United fan, in large part due to coming from the same area of London as former United star David Beckham. “David Beckham was always an idol of mine,” said Gayle, who is yet to score in nine appearances this season.